The story has been told of a woman who gave birth while in a coma and woke up twenty-three days later to find her baby in her arms. A mother stunned doctors when she reportedly woke up from a 23-day coma the moment her newborn son was placed in her arms. Amanda da Silva, 28, who suffers from epilepsy, had a seizure while 37 weeks pregnant, which she claims was triggered by a heated argument with her husband. Concerned the seizure could kill both the mother-of-three and her unborn baby, doctors sedated Mrs da Silva and delivered her son Victor via an emergency C-section last February. Complications set in immediately, forcing medics to place Mrs da Silva in a medically-induced coma to stabilise her, while 4.6lbs (2.1kg) Victor was taken to intensive care. After spending weeks unable to move or communicate, nurse Fabíola Sá suggested placing Victor on Mrs da Silva's chest, which immediately caused her heart rate to quicken and tears to cascade down her face. 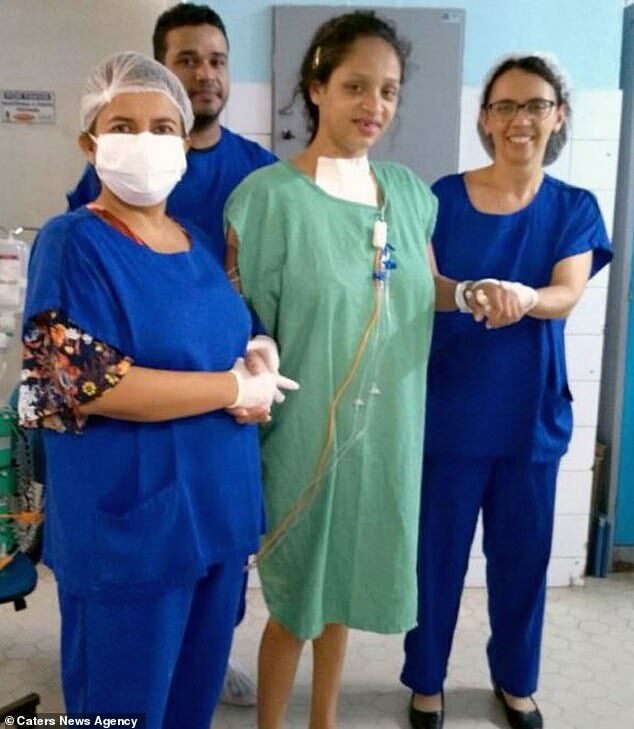 Mrs da Silva, from Fortaleza, North East Brazil, slowly started to improve until, 20 days after she first held her son, the pair were finally able to go home. 'We don't have a scientific answer to what happened but it's evident we should never underestimate the importance of skin-to-skin contact between mother and child,' Ms Sá said. Mrs da Silva, who has no memory of giving birth, said: 'The first thing I remember was having Victor in my arms, seeing his little head and smelling his lovely scent. 'It was an amazing situation but at the same time confusing. Ms Sá, an intensive care nurse at Ceara's Assis Chateubriand Maternity Hospital, where Victor was born, said: 'Her response was immediate. Mrs da Silva, who also has a four and two-year-old, was rushed to hospital with an acute seizure while around nine months pregnant. The convulsions threatened both of their lives due to the low amount of oxygen reaching her brain and womb. Doctors therefore performed a C-section, which led to her being placed in a coma. Victor was born with a weak immune system and respiratory problems due to the medication his mother had been taking to stabilise her epilepsy during pregnancy. He was therefore sent straight to neonatal care where he stayed for six days before going to a semi-intensive care unit. Mrs da Silva was transferred to intensive care where she remained in a deep coma. The young mother later managed to open her eyes but was unable to respond or react to any communication. 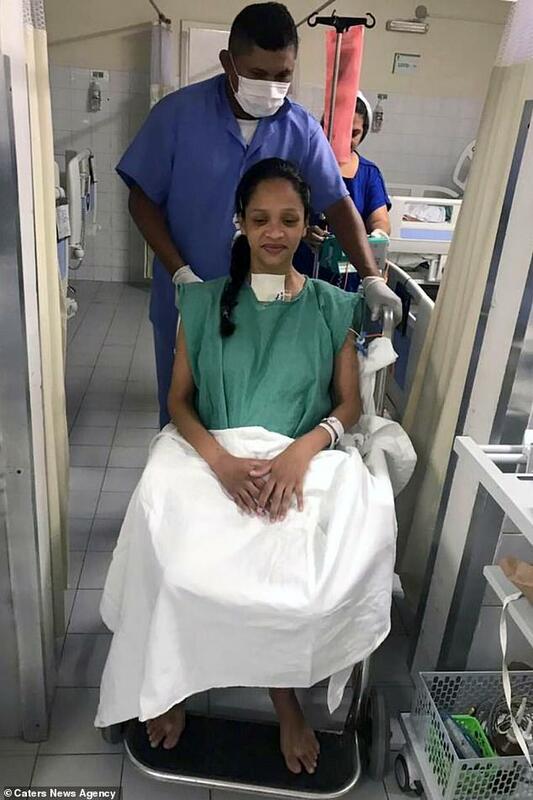 Obstetrician Carlos Alencar said: 'Just over a week after she was admitted to hospital we began removing the sedatives that kept her asleep, but she didn't respond as we expected. 'Although all the exams testified she had a good neurological response, she didn't move. 'We applied pain stimuli, but she didn't react. The exams showed brain activity, but the areas of activity weren't responding to anything specific, not even to the voices of relatives. The medical team were running out of ideas and were on the verge of sending her to another health facility when nurse Ms Sá suggested putting Mrs da Silva and her son together. 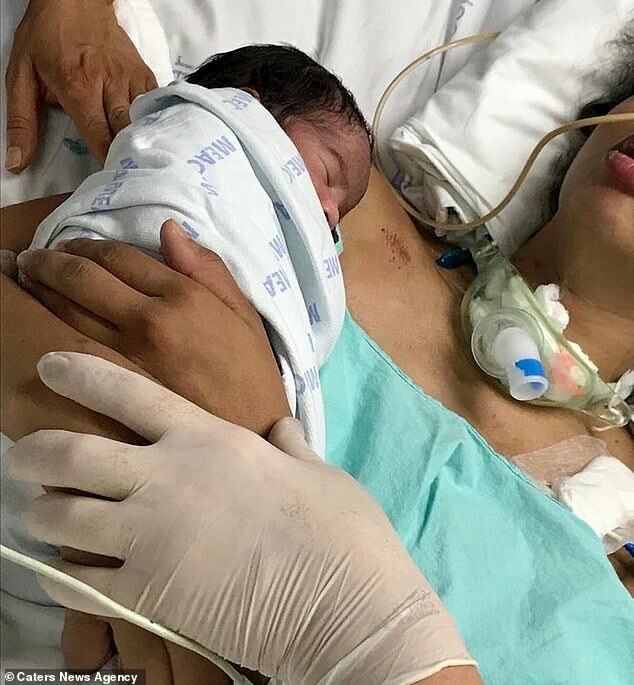 Due to Mrs da Silva being motionless and unable to hold her child, Ms Sá wrapped the new mother's arms around her son, cradling him on her chest. To everyone's surprise, the moment the baby was placed 'skin-to-skin', the unconscious Mrs da Silva's heart rate quickened, and she started crying and producing milk. 'As soon as Amanda felt the touch of the baby's skin on hers, tears started pouring down her cheeks. It was a cry of love,' Ms Sá said. 'More than that it was a cry that said: "I'm still here, I'm alive, I want to live''. Due to the medication Mrs da Silva was on, doctors would not let her breastfeed. But the new mother continued to improve until she was unable to move her limbs and sit up in bed. Nearly three weeks after she first held her son, Mrs da Silva was able to take Victor home for the first time. Mrs da Silva has suffered from chronic epilepsy, which she has taken strong medication for, since she was seven years old. When she discovered she was pregnant for a third time, which she claims was unplanned, doctors told Mrs da Silva to stop taking one of her treatments due to the risk of foetal abnormality. This left her on just one drug, which caused her to endure more seizures then she did in her past pregnancies. The unusual case is being studied by medics to assess the importance of different medications in pregnant women with epilepsy.